CANDLEMASS - EPICUS DOOMICUS METALLICUS VINYL (LP 180G BLACK) | Online Shop | Wizard LTD. Album: "EPICUS DOOMICUS METALLICUS VINYL (LP 180G BLACK)"
&apos;‘Epicus Doomicus Metallicus&apos; is a true classic. Every track is undeniably strong - heavy metal riffs blended with almost neo-classical touches, plus some theatrical elements bringing to mind bands like Mercyful Fate (thought to be another influence). This is one of the definitive Doom Metal releases, immortalising the band, alongside early developers of the style such as the US band, Pentagram. &apos;‘Epicus&apos; was recorded at Thunderload Studios in 1986 and was released later that same year. The vocals for this, their debut album, were handled by Johan Längqvist, before the iconic vocalist Messiah Marcolin became a solid fixture in the band until the early nineties. 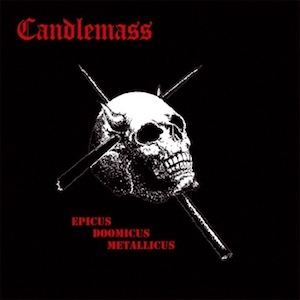 Candlemass instantly became a great inspiration to countless metal bands upon the album’s release in 1986; a time when thrash metal, not doom, was fast becoming the dominant style in both Europe and the US. Bands such as Paradise Lost & My Dying Bride rate the album very highly to this day - Paradise Lost particularly ranking ‘Epicus’ among their favourite albums ever. This vinyl edition of ‘Epicus’ comes on red 180gsm vinyl with black & white labels. The gatefold sleeve features the original artwork (red text & skull not white as on the CD) on a matt laminated sleeve with logo & text on front in spot varnish. It will also include new sleeve notes written by the band. Limited 180gms coloured vinyl in numbered gatefold sleeve.